Belgium is an amazing country on many levels: Beer, food, history, chocolate, tapestries, lace, cheese and people. The focus here, of course, is the beer from this greatest brewing nation in the world. 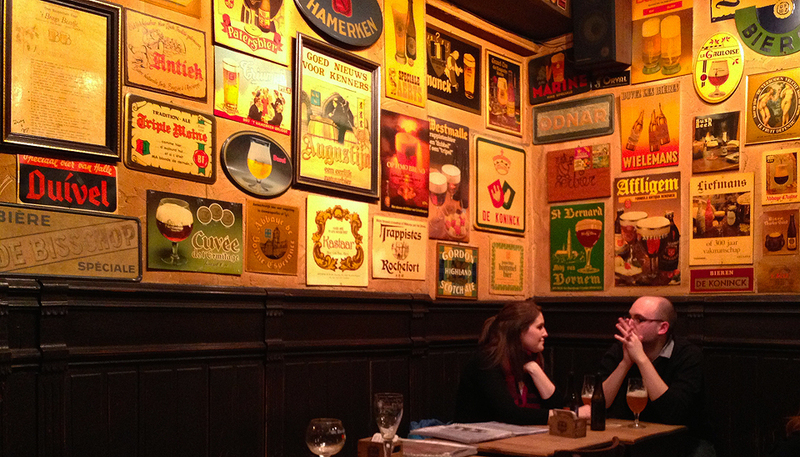 What makes Belgian beer so special? Taste and variety. Belgium produces more than 1200 different beers. Not just different, but eventful ones from more than 150 breweries. All within a country you can traverse in about three hours. Now is your opportunity to experience the magic of Belgium! The tour begins in the lobby of our hotel in Bruges and ends at our hotel in Leuven. We plan to visit at least 4 brewery locations, and or taprooms, featuring, Trappist Westvleteren, Halve Maan, Trappist Chimay (New addition to tour) and Brasserie Caracole. Other highlights include, Bruges, Leuven, Bastogne and the Bastogne WWII Museum, Memorial Museum Passchendaele 1917, Tyne Cot Cemetery & Visitor Center and the Abbey of Chimay, aka, Abbey de Scourmont. We will be staying in Bruges, Mont and Leuven. Seven nights accommodations in nice, friendly, centrally-located hotels often in the old town section of the city and some in bucolic rural settings. Day One, Sun., June 9 • Bruges – This morning at 10 a.m. we meet in the lobby of our hotel in Bruges. We’ll have a short meet & greet, and then have a tour and a company lunch at the Halve Maan Brewery & Museum. They are the brewers of Zot and Straffe Hendrik. After lunch, we’ll take a canal boat ride and learn more about the history of Bruges. This afternoon and evening, you’ll have some more free time to take in the many sites of Bruges. Rent a bike, take a carriage ride, visit museums, or just people watch, while savoring a Belgian beer in a sidewalk café. Day Two, Mon., June 10 • Bruges -- This morning we catch a train to Ostend with its huge beach and nature is a major destination for Belgians in the summer, especially on the weekends. Friday afternoon traffic jams are common all the way from Brussels to the seashore and the trains are packed with vacationers. Today, you’ll have a special day trip with Karin Van Acker, a friend and regional guide, in a 1974 vintage VW bus. Visit her website at Toppezot Van Bier to learn more. You’ll visit the new Jus de Mer Brewery, and visit some other points of interest in and near the North Sea coastal town of Middelkerke, taste some beers along the way and enjoy lunch on your own of homemade spaghetti at one of Karin’s favorite cafes. Day Four, Wed., June 12 • Mont -- Today we check out and depart for the Ardennes Mountains and Chimay, where you will have lunch on your own at their taproom called Auberge de Poteaupre. The company buys the beer. For beer, I suggest the “Beer Tree” with four small sampler glasses of the four Chimay beers. If that seems like too much, split one. The “Beer Tree” makes for a great photo opportunity. Day Five, Thur., June 13 • Leuven -- This morning we check out and head to Jack’s Woods, aka, Boise Jacques and the U.S. Airborne memorial, near Foy, Belgium. This forest was where the famous battle took place that was depicted in Band of Brothers. Afterward, we’ll continue to tour the Bastogne WWII Museum, where we’ll learn more about the Battle of the Bulge, known in Belgium as the Battle of the Ardennes. You’ll have about 2 hours to tour the museum and the Mardasson Memorial next to it. Next, we have a late lunch and a beer tasting at the Abbey of Maredsous. It’s a magnificent visit set in an absolutely beautiful location. Everyone leaves happy. So, if you are hungry, you may have a snack at the nice cafe of the Bastogne Museum before we depart. Maredsous has a blond, double and a tripel. All excellent abbey beers, brewed by Duvel Moortgat in Breendonk. They have a nice beer garden, so if they weather is good, you may dine outside. You are on your own for lunch, but the company buys the beers here. You’ll get a paddle of all three beers along with some cheese from the Abbey. After lunch, you’ll have time to visit the attractive Abbey grounds and the chapel. There is also a nice gift shop next to the cafe. Day One • Bruges The tour begins in the lobby of our hotel in Bruges at 12 noon. In the summer, Belgians flock to the scenic coast. You'll see why. This afternoon, we’ll board a train, enjoy some welcome beers on board and take a day trip to the North Sea coastal city of Ostend, where we’ll experience the fascinating and thought-provoking Marvin Gaye Walking Tour. Few people know that Marvin Gaye spent 18 months living in Belgium, where he wrote his famous Midnight Love album. Whether you are a fan, or not, you’ll find this walking tour fascinating and emotional. The walking tour includes an audio guide with narration and music. Think I Heard it Through the Grapevine as you stroll the scenic boardwalk of Belgium’s North Sea. "As a washed-up, drug-haunted American soul-legend, where would you go to clean up, get fit and reconnect with your musical soul? Possibly not (for all its charms) Ostend in the grip of winter. But the ferry to Belgium's 'Queen of the Seaside' was exactly what US singer, Marvin Gaye, took one chilly February morning in 1981. Part refuge, part exile, those months in Ostend proved to be a fresh start for the silky-smooth voice of classics like 'Mercy, Mercy Me.' Ostend set him back on the road to success. But in a way, also on a sad slip back into his bad old ways – and then to an untimely death. So did Ostend save Marvin Gaye, or just press pause on his ultimate decline?" After the walking tour, we’ll return by train to Bruges.